We’ve all been approached by a group of kids wanting donations. While some fundraisers offer some popular products that we can get excited about, many of them aren’t very interesting. If you’re starting off with a weak product, your marketing efforts won’t do much good. While your family may support your fundraising efforts, door-to-door selling will be tough. There are definitely high-quality fundraising products that use order forms, but they’re very difficult to sell to strangers. When you’re able to give them the product they’re paying for immediately, it’s an easier sell. How quickly can you receive your order? Do you get any help from the fundraising company? Make sure that you have the bandwidth in your schedule to take on the fundraiser. How much does the fundraising company require you to spend upfront? Does upfront spend affect your profit margins? There are product fundraising companies which extend credit to schools and non-profit organizations. Your product needs to be accessible to the market you’re selling to. If donors can buy the same product for a lower price elsewhere, it weakens your pitch. The fundraising product itself needs to present at least some real value on its own. Some high-quality products offer low profit margins below 20%. Finding the best value between quality and profit margin is essential to your bottom line. What kind of people are interested in my product? Customization: does your product fundraising company offer customizable labels and graphics? Your pitch: write a simple introduction and know the strengths of your product! Get it ALL with World’s Finest® Chocolate! 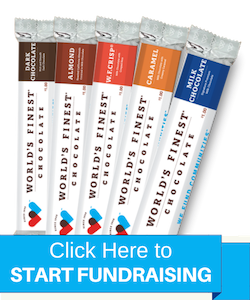 World’s Finest Chocolate has all the ingredients of an awesome product fundraiser. Since 1949, we’ve raised more than $4 billion for organizations like yours. We make our chocolate using our unique family recipe - straight from the cocoa beans of our St. Lucia farm. You can also customize chocolate boxes with your logo or event graphics...for free! Each chocolate bar costs donors either $1 or $2, so the price point is accessible for everyone. Your profit margin can be as high as 50%. Some of our customers even qualify for zero upfront costs...and bonus checks for selling out! How great is that? You’ll receive your order in 3-5 days. You’ll also get your very own local representative to help you from beginning to end. Your product fundraiser can be over in 2-3 weeks, easy. Get in touch with your local representative today. Or, pick up your free fundraising guide. You’re just steps away from fundraising success.